Summer has gone and Fall has finally arrived, and that means more games to come that will make you stay in your room even more than you have earlier this year. Well be prepared heroes! You will be slaying monsters, protecting the innocent, and even have a companion, who is a ghost, all at your hands to experience this Fall with the Incredible Adventures of Van Helsing II: Complete Pack. The pack is now available on Steam for $19.99 for both Windows and Mac, plus you will be able to get the official soundtrack of the game. The Incredible Adventures of Van Helsing II, continues the adventures from where the last of the Van Helsing action-RPG trilogy left off. It all was suppose to be a simple adventure, where players are put into the fierce battles against supernatural foes, mad scientists, and take on mini-games that will help fight against the evil that are attempting to overrun your tower in a tower-defense style game. “The gothic metropolis of weird science is on the brink of destruction as chaos rules the streets and a new enemy plots revenge. It’s time to enter the dark side of Borgova and the forbidden wilderness, but beware: you are not the only one behind a mask. ” There is a free demo that you can experience, that has been made available on Steam. 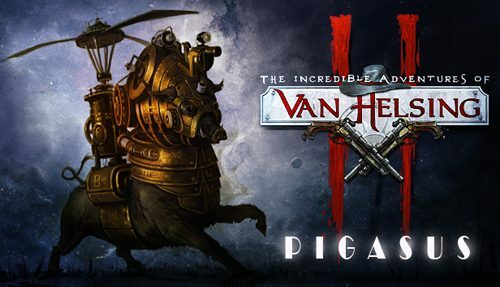 In The Incredible Adventures of Van Helsing II: Complete Pack, players will get to experience Van Helsing II, Van Helsing II: Ink Hunt DLC, and the Van Helsing II: Pigasus DLC. In the Pigasus DLC, as you can see in the image below, has some type of a strange creature? It seems to have a bulls body, but yet it seems to have a pigs head. Is it a pig that can fly? Weird things are happening in the universe of Van Helsing. The Pigasus brings the world weird science experiments, where you explore a murky Otherworld, known as the Ink, and you will need to find out information about the world beyond, and also collect the extremely rare artifacts that you find along the way. “Spend some precious Essence, summon this strange creature to your Lair… and buy some rare new items from the Pigasus!” You can get the DLC separately on Steam for $2.99. You can find out more information about the game on their official site. Plus like them on Facebook and follow on Twitter for updates on Van Helsing.